1.In a large bowl, cream butter and sugar until light and fluffy. Add milk and vanilla. Gradually add flour and mix well. 2.Place 1/2 cup of dough in each of two bowls, reserving balance in separate bowl. Add red food coloring to one bowl and mix thoroughly.Small orange dough for nose. 3.Add green food coloring to one bowl and mix thoroughly. Shape the uncolored dough into twelve 1-inch balls and twelve 1 1/2-inch balls. 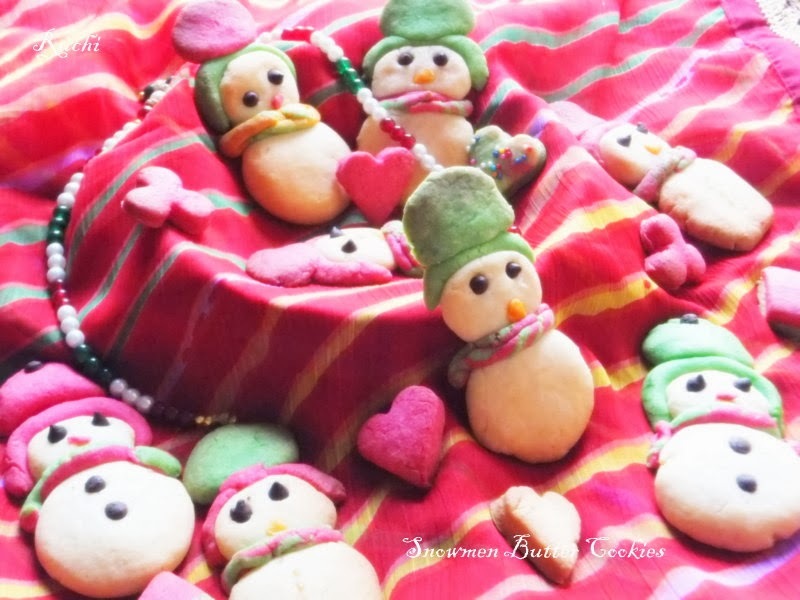 4.For snowmen, shape white dough into twelve 1-inch balls and twelve 1 1/2-inch balls. Place one smaller ball above one larger ball to form the snowman body and head. 5.For each snowman, then form the hat and the scarf. 6.Make hats with coloured dough.Shape red dough into 12 ball For hat, roll 1-inch ball and a flat disk for brim. Place on head. Place triangles above heads for hats; attach in white balls for tassels. 7.For scarf, shape 1/4 teaspoon of each color of dough into a 3 inch rope and Make two small ropes one with red and one with green, twist them together and twist together. Place scarf around snowman's neck. 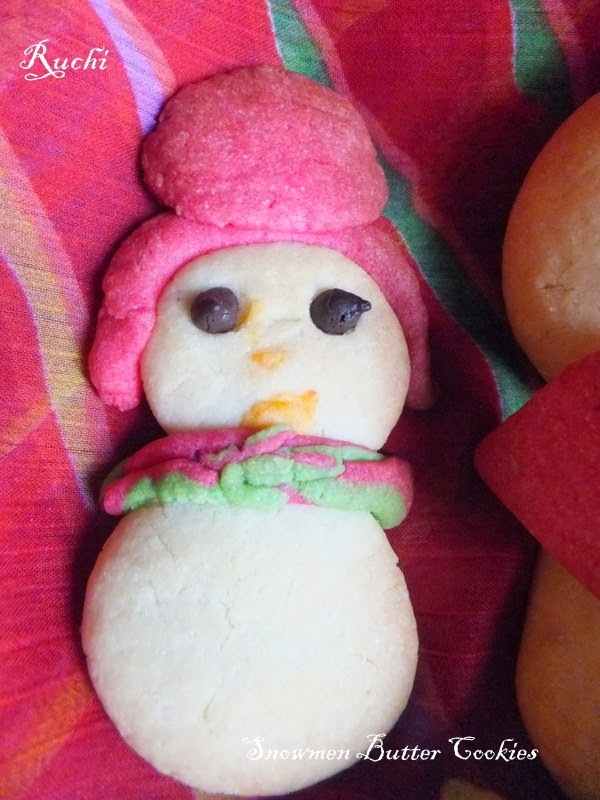 8.Shape orange dough into noses and Add chocolate chip eyes and buttons. 9.Bake at 180 degree for 10 to 13minutes or until set. Cool for 2 minutes before carefully removing to wire racks. Store in an air tight container. 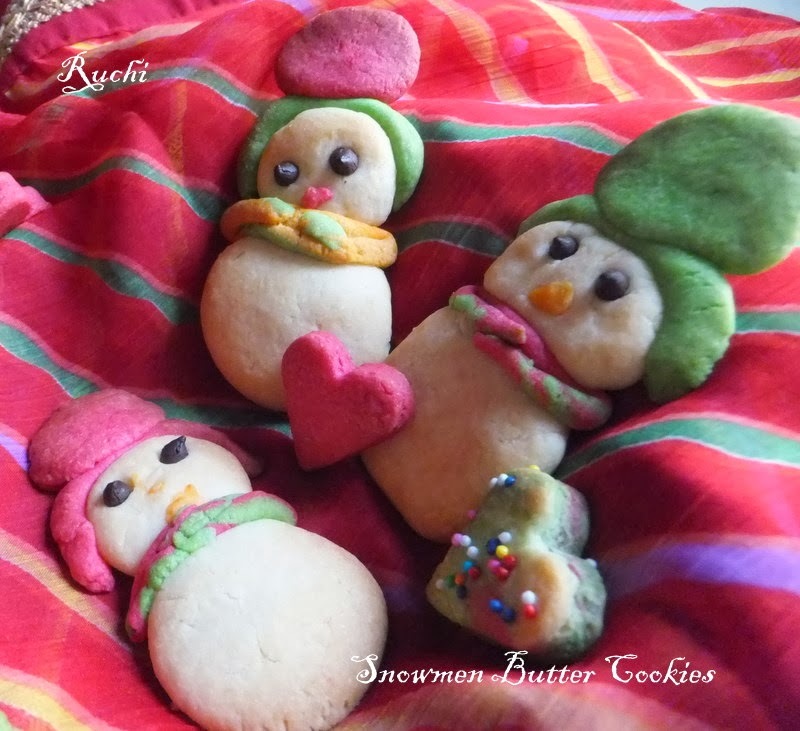 Amazing snowman cookies :) you have done really well :) they look super cute and thanks so much for participating. First time here and so happy to follow your lovely blog. 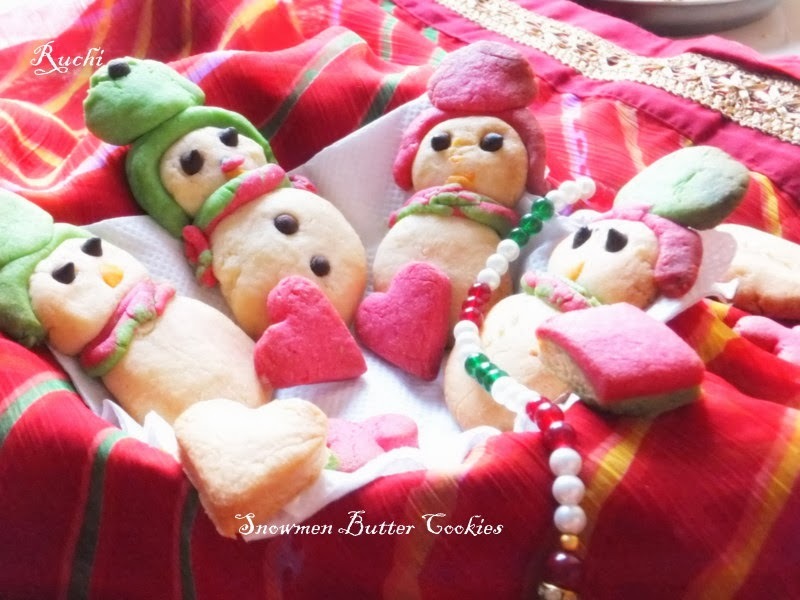 Lovely snowman cookies.happy to follow your lovely blog.super decorated cookies. Hello! I simply want to offer you a huge thumbs up for your excellent information you've got here on this post.